“Rejoice always!” This Sunday we will hear this call to rejoice from St. Paul. The Church calls this Sunday Gaudate, the priests and deacons wear rose colored vestments, and we are reminded to Rejoice! I know exactly what this looks like in children. I know what a little kid who is rejoicing looks like. Jumping up and down, boisterously shouting, maybe even fist pumps and high fives. Sometimes children even just sit and stare in unbelief in a stunned zombie like trance, overcome with joy. While we know what it means to rejoice as a child, I think it is harder to judge what it looks like to rejoice as an adult. Sure, when our alma mater scores on the final drive to upset a hated rival, adults will jump and holler. On the day of a wedding adults will dance and raise glasses, but these are all culturally expected behaviors. What does it look like when an adult spontaneously rejoices? I’m not sure I know the answer. But what I do know is that we have a whole host of behaviors that we do this time of year that I think are supposed to be the actions of rejoicing that seem to be so far divorced from their reasons that we forget they are actions of rejoicing all together. As we rejoice on this third Sunday of Advent in anticipation of Christmas, what are we up to? We bake cookies, we decorate, we prepare a large meal, we exchange gifts, we see family and friends socially, we send cards, and more. Why? For me, sometimes, these actions become an end in and of themselves. We bake cookies because they are delicious and we always have. We put up a tree and decorate because we did it last year. We roast a silly amount of meat and buy much wine because people are coming over. The reality for the Christian is that we bake, decorate, and feast because our Lord Jesus Christ has been born in Bethlehem. We rejoice because Jesus has become human. Jesus has become human to be close to us so that we can be close to God. Jesus has be born to heal, restore, and save us from death forever. Nostalgia, pleasure, and habit aren’t good enough reasons to rejoice. When those are our reasons for rejoicing, our joy ultimately falls flat. However, when we rejoice because the God of the universe love us so much that he puts our lives before his, then we rejoice for a right and justified reason. The reason for our celebration is the greatest thing that has ever happened in the history of mankind! God is born to us! 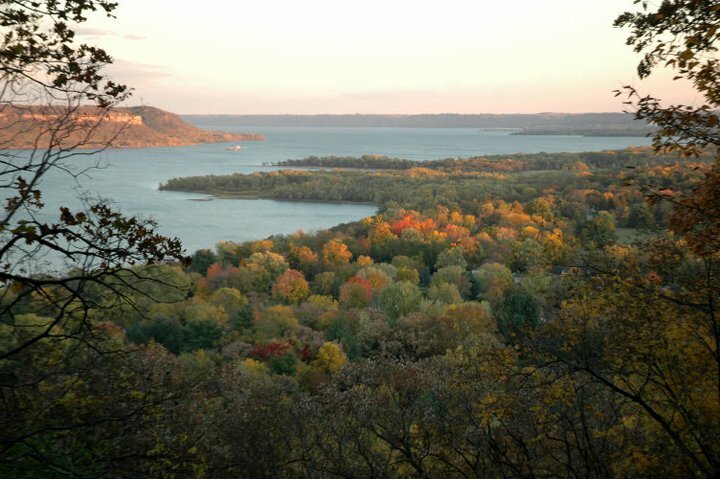 A couple years ago I took my family camping in a state park here in Minnesota that overlooks the Mississippi River. On Saturday morning the whole family decided to take a hike down to the river’s edge. We filled water bottles, tied our shoes tight, and headed down the 200 foot bluff face trail. After a half hour of playing in the water and collecting driftwood, we decided to head back. That is the moment my children realized those who hiked down, must hike up. Trying to climb straight up the side of the bluff would have been impossible. Instead, the path was a series of switchbacks that took the height of the bluff and spread it out over a longer distance. The way the path was designed made the bluff easier to climb. Both in our gospel and the first reading from Isaiah, we heard the call to “Prepare the way of the Lord. Make straight his paths.” Just like the path on the bluff was changed to make it passible, John the Baptist and Isaiah ask us to make the path to our hearts passible for Jesus. This time of year more than almost any other time, it can feel like there are many obstacles to Jesus entering more deeply into my life. Whether those obstacles are a product of the lives we lead, our current culture, or our own decisions, the call is to remove those obstacles. Some of these obstacles may feel as difficult as moving a mountain or filling in a valley. The reality is that with God’s help, no obstacle is permanent. No valley too deep, no mountain too large, nothing stands in the way of God’s desire to be near to you. Whatever is in our past and whatever is our present, there are actions we can take to make straight the path for Jesus to come more completely, fully, deeply into our hearts. Hidden within advent are behaviors that help us straighten paths. It’s really this simple. On a daily basis, light a candle (Advent Wreath), turn down your lights, turn off or put away all screens, and sit in total silence. Remove the obstacle of noice and stimulus and simply let God in. LIVE IT: Commit to 10 minutes of silence every day for the next week. Do you zone out easily? To zone out is to kind of look off in the distance and think random thoughts that don’t have much bearing on what is presently happening before you. Some people zone out in meetings or conversations or class. But when happens when the conversation partner, boss, or teacher catch us zoned out? Not good. In the gospel, Jesus commands his disciples to be watchful and alert. Jesus invites them to be like servants who stay awake and watch, waiting for their master to return from a long journey. He goes on to warn them against the dangers of being caught asleep and unprepared. In other words, he asks his disciple not to spiritually zone out. What does it mean to spiritual zone out? I’m not talking about zoning out during Mass, though we should work against that too, no I am talking about zoning out during the most important and impactful moments of life. I think it is easy to become the kind of people who start zoning out during boring or lifeless or even painful moments, but then start to get so good at zoning out that we start doing it during the fun, exciting, and joyful moments too. We sometimes get so good at avoiding pain by zoning out that we never truly feel joy or love because we sleepwalk through those moments too. Advent is the season of waking up. This weekend starts the process of becoming awake and aware and watching for the abundant gifts God has in store for us. But the key is to wake up and watch. Whether you zone out independently or by mindlessly scrolling through your phone, now is the time to wake up, to watch, to breath deeply of God’s good gift of life. Live it: Wake up by actually waking up. Don’t hit your snooze at all this week. Plan on leaping out of bed and taking 5 deep breaths right away. If that means you are up 9 minutes early, spend those 9 minutes in prayer asking God to spiritually wake you up. Nobody ever paints that scripture on a piece of barn word and then hangs it in their kitchen. Maybe I watch too much kids television, but a bear and a cow could totally be neighbors as long as one of them was dressed in overalls. Isaiah is trying to explain how radically different the kingdom of the Messiah is from the way things are. Isaiah is seeking to break through the “this is the way things have always been” attitude of the people. He uses these irrational, fantastical pairs of animals who are mortal enemies in order to explain that when the chosen one comes, everything is going to be different. Now that we are fully into Advent and the wreaths are out, gifts are being purchased, and Christmas songs blare ceaselessly on the radio, are you preparing for a different kind of life at Christmas time? Or are you preparing in almost the exact same way as last year? If you are expecting the same experience of Jesus that you had last year, then maybe you are preparing in the same way. Isaiah and John the Baptist both are suggesting the that the God you are expecting is nothing compared to Jesus, the God who is to come. Let’s make 2016 a year we prepare for Christmas differently because we are expecting a different experience of Jesus Christ at Christmas. If last year you listened to a lot of Christmas music this time of year, then make just one of your drives in silence this year. On your way to work or to pick up the kids, or on the way to whatever it is you do, try going in silence and invite God into that moment of silence. For the complete Sunday readings click here. What is the happiest moment of your life? Most people answer one of a couple answers. Some people say it was the first moment they met the love of their life. Others say it was their wedding day. And a lot of people say it was the birth of their children. Of course there are other answers, but many, if not most people, name one of these moments. What do these moments have in common? They are all the start of a life long relationship. Whether it was a marriage relationship or meeting one’s child face to face, something about the beginning of our families that brings use immense and beautiful joy. When we look back, those moments are joyful in and of themselves and represent so man moments we have with those people afterward. Even when those relationships end, the great sorrow of their ending says something about happy they made us to begin with. In the ten or so days of advent, these readings remind us to look forward to Christmas 2014, like we would look forward to the happiest moments of our lives. More importantly, we are being invited to recognize that our relationship with Jesus, whether we’ve been at it 90 years or we’re just beginning, is the source of joy and happiness. Jesus being born in a manger and Jesus coming deeply into our hearts in 2014 are worth of overwhelming joy and happiness. Rejoice! Smile! Take a couple minutes to think about Jesus, your faith, or the coming of Christmas and smile wide. Up and down into a deep river valley is tough hiking and our kids were troopers, but tired troopers. They probably would have voted for an easier path if they had the chance. Both our first reading and our gospel talk about making the trail easier to travel. The reading from Isaiah talks about filling in valleys and making mountains and hills low. In the gospel from Mark, John the Baptist is identified as the messenger preparing a way and making straight the paths for the Lord. John doesn’t regrade roads or level hilly interstate for Jesus’ physical travel, but instead straightens and prepares the pathways into people’s heart. That way when Jesus arrives, his way into people’s hearts and lives is straight and easy. If you’ve had an encounter with Jesus Christ, I bet there is someone who straightened the path to your heart. Who helped to prepare you to know Jesus Christ? Who has helped you to meet and fall in love with God? Who has removed the obstacles to a deep faith that were in your life?